This sixth floor unit with its beach/nautical décor is perfect for a couple or small family. The condo is equipped with everything you need for comfort and convenience. The open, living area has a 50 inch TV with DVD, stereo system and high-speed internet connection. Bunk room has 24' TV and the master bedroom has its own 40 inch TV and DVD player and view of the gulf. The fully-equipped kitchen has plenty of dishes, cookware and utensils for those who like to cook. There is seating for 4 at the dining table with room for 2 at the breakfast bar. The washer and dryer make it easy to keep those beach towels clean or to get a head-start on the laundry before leaving. Ceramic tile in living areas, carpet in master & bunk room. 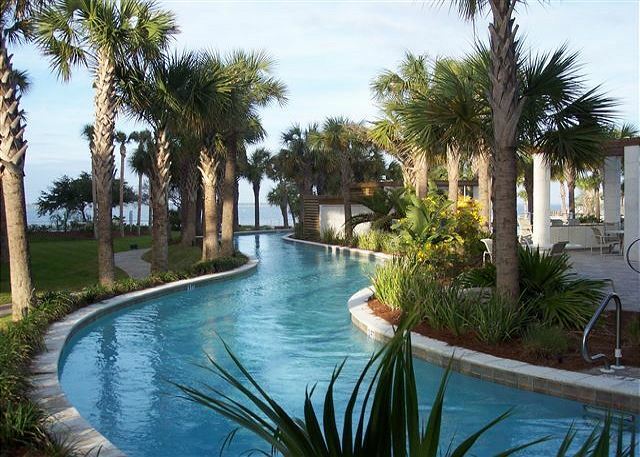 Children will stay entertained for hours with all the water features at Destin West Beach & Bay Resort. Adults will also enjoy the carefree feeling of floating around the lazy river, reading underneath a palm tree or just sunning on the pool deck. 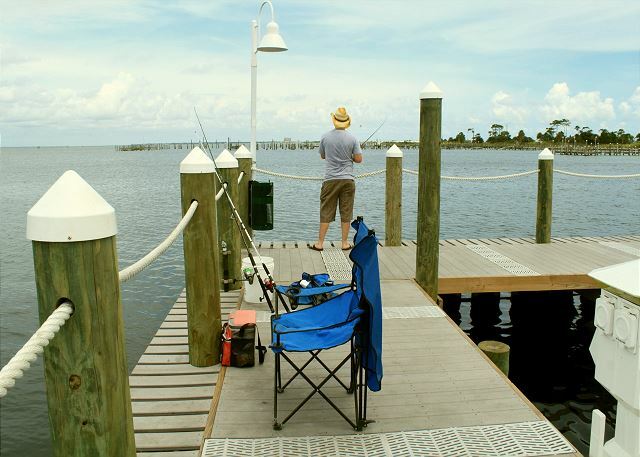 The Choctawhatchee Bay provides an ever-changing view – barges and other watercraft, along with sailboats, windsurfers, and dolphins creating interest during the day and beautiful lights at night. The beach lovers in the family will not mind the 7-9 minute walk across the skybridge to get to the beach. Beach service is available for umbrella, chair and boogie board rentals. 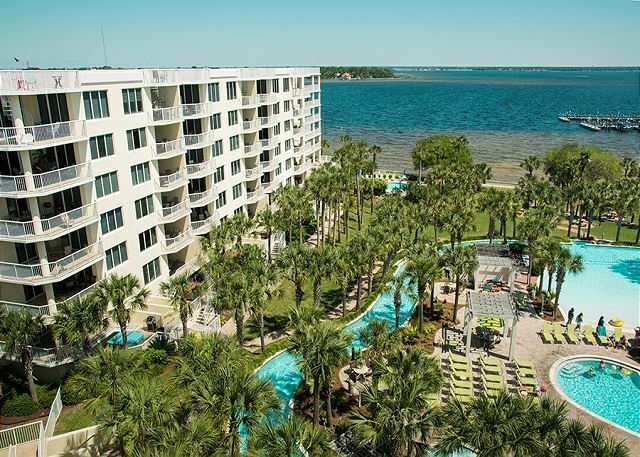 Guests at Destin West get to enjoy all amenities beach and bayside. 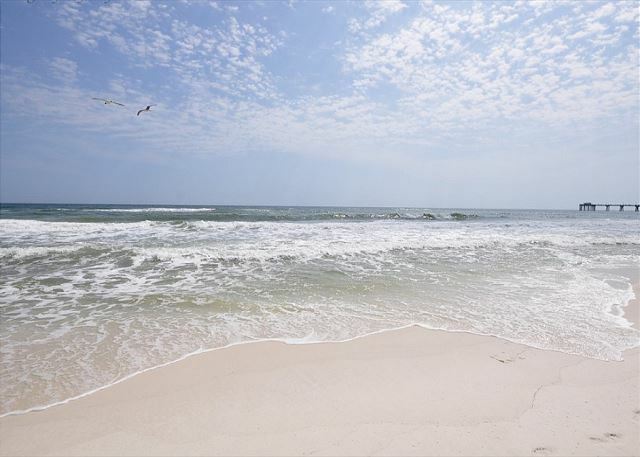 Located only 6 miles from Destin – same gorgeous beaches, but none of the crowds and a whole lot less traffic! Come stay with us – you’ll learn why so many families keep coming back year after year! Everything from the booking process to the check out process was smooth and easy. The condo was immaculate, the resort was fabulous and the staff of DestinWestCondos was exceptional. The views from this condo are great and the condo was very clean and well furnished. Needless to say we had a great time and will be back. We have rented several times from the rental office onsite but never again. This condo and the staff were leap years above the other rental company. Thank you Julie, Robyn and Josh. Oh and we went fishing with Josh who is a charter captain. We were thrilled with our fishing trip. Josh is a very nice young man and a great fisherman. As others have said, “we will be back”. Dear Ms. Hughes, We're so happy to hear from you and are so pleased that you had such a wonderful time staying with us! We're already looking forward to having you back again, so until next year! We had a great time, the room was wonderful! We look forward to coming back next year. Dear Mr. Duncan, We're so pleased to hear that you had a wonderful vacation! Thank you so much for this great review! We can't wait to have you stay with us again! 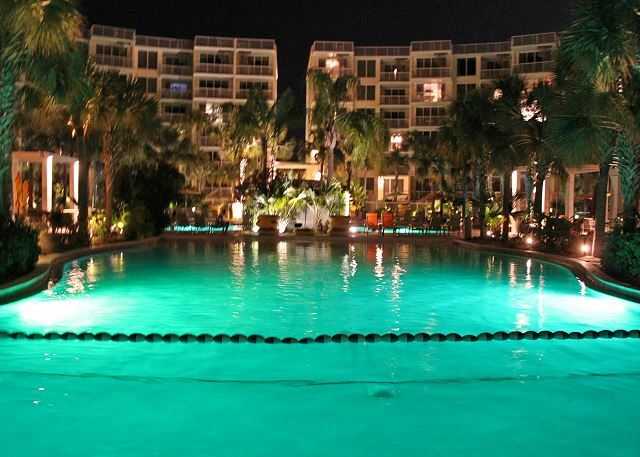 Destin West is one of the best places to stay at the beach! The unit was the perfect size for the 4 of us. We were pleased that it was stocked with anything needed for cooking. It also has several tea jugs and a couple of storage containers for leftovers, etc. They provided a generous amount of dish soap, laundry detergent, and towels. I was relieved to discover lots of towels were available, because most other places tend to be stingy with towels. This unit has perfect views of the water and the pool area. As we were leaving we noticed there is a toddler play area leading from the pools to the parking garage! We never knew that and this is our second time here. We also enjoyed walking in the bay looking for shells and watching the fish. This bay area is nice and clean, not murky like some people might imagine it. Oh, and the pillows and sheets smelled amazing!!! I know that is random, but who doesn't love fresh smelling linens! Dear Ms. Stinson, I love the smell of fresh linens too! So glad to hear about your wonderful time with us. We can't wait to have you back again soon! Amazing view with a very clean and updated condo. We could not have asked for anything better. We will definitely be back !The property mngnmt were so helpful and kind as well ! Dear Ms. Molpus, We're so happy to hear that you had a wonderful visit! Thank you for your sweet comments. We're ready to book your next visit whenever you are! Our family had a great time at our rental. Location was not the best , but overall had a very pleasant stay. Condo was very clean and had everything we needed.If I had to complain about anything it would be that pool/lazy river closed to early. I would recommend pelican 606 to family and friends! Brock, thank you for your kind words about our condo. Location really depends on preference. Some do not mind the 7 minute walk across over to the beach but some do. Others prefer this condo for the fantastic views of the bay/lazy river area. 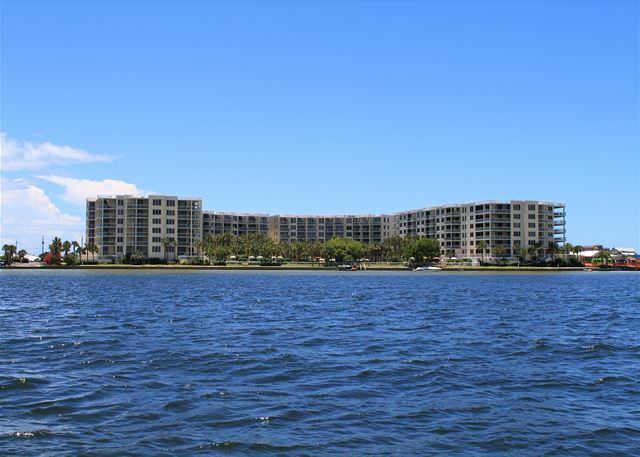 We hope to see you back soon and maybe we can find you a condo that meets your preferences this time now that you have a better idea of the layout of Destin West. amazing, the only down side was the AC was on the fritz, the management team had someone up there in 30 min (and that is fast) and they took care of it. We only stayed one night because we wanted to extend our vacation. We loved all of the amentities! The condo was excellent. Had all the room we needed and the view of the bay was outstanding. The staff did an excellent job at making sure we were taken care of. Any questions I had they were able to answer immediately. The condo was very clean and had all that we needed. Loved all the pools and enjoyed the walk to the beach. The beach was beautiful and so relaxing to just look at and experience. Will be making it our new family vacation destination each year and will be looking forward to staying at the condo again. Thank you guys!! We look forward to having you back each year. The view from this room was wonderful. The room it self was very clean and neat. We were highly satisfied with our stay. We did not want to leave at the end of our stay. We were already planning our trip for next year. Came over to DestinWest for a vacation with my family(3 daughters, wife and father in law) August 17-22. We were so surprise how beautiful the place is and well maintained. Everything you need is already in there for all the activities that yoh wanna do. From swimming to the pool or hang out in an inner tube on a lazy river, fishing in its own pier, water sports from boating, kayaking and many more are all in the facility. Restaurants and grocery stores are very close to the resort so you can cook your own food or barbeque near the pool. We really had a great time and I think this will be our place when we come for a vacation at Fort Walton Beach. Over all we were very pleased. A few issues that need to be addresses. Checking out the doors, we found the furnace filter long past needing to be changed. Why would the cleaning crew not notice this. We trashed it and put a new one on - thanks for leaving those. Ice maker/water filter had red light on - and was clogged - water worked but no ice through door. Outside cleaning crew was spraying off the front exterior - and a few hours later the inside of the entrance hall stunk...was like that for several hours - maybe a leak near the front door. We laid out - and only way we would beat it is to be on the top floor - so we could enjoy ocean view as well. Lazy river/pools were excellent. 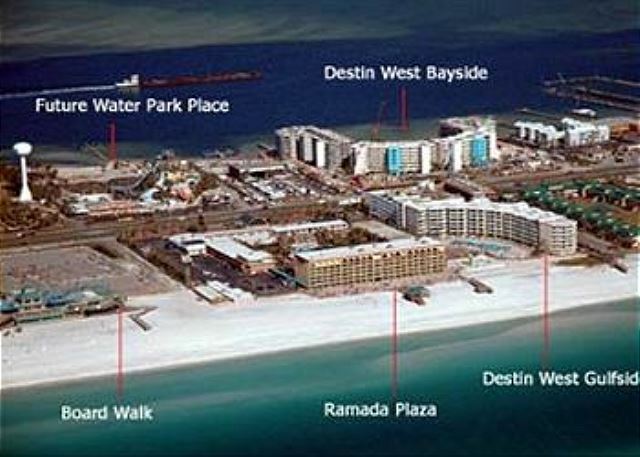 I have stayed at Destin West on multiple occasions from short term to long term. I recommend working with Julie Rawson. DW is family friendly with great options for the family and friends.